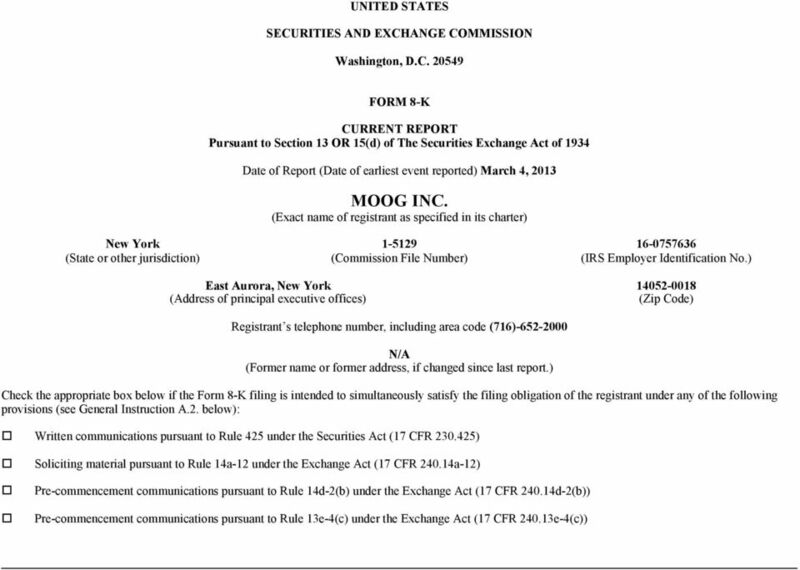 Download "MOOG INC. (Exact name of registrant as specified in its charter)"
3 Item 1.01 Entry into a Material Definitive Agreement. 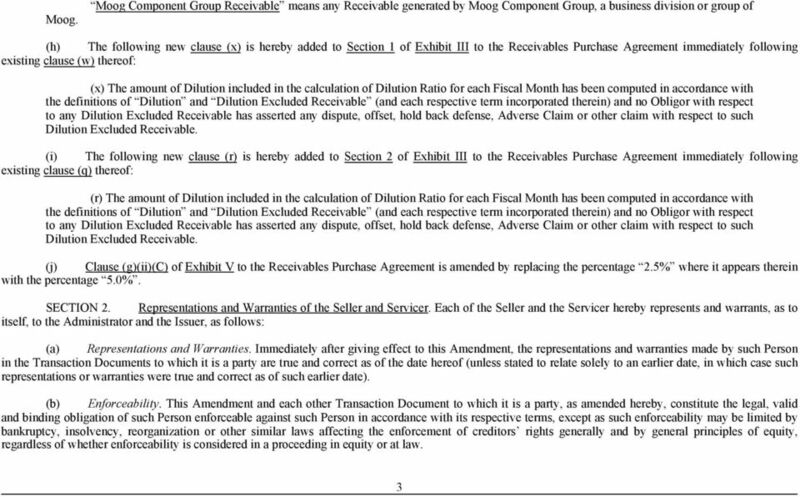 On March 4, 2013, Moog Inc. (the Company ) and Moog Receivables LLC, a wholly owned bankruptcy remote special purpose subsidiary of the Company (the Receivables Subsidiary ) entered into the Second Amendment to the Receivables Purchase Agreement, dated March 4, 2013, by and among the Company, as initial servicer, the Receivables Subsidiary, as seller, Market Street Funding LLC, as issuer (the Issuer ) and PNC Bank, National Association as administrator (the Second Amendment to the Receivables Purchase Agreement ). The Second Amendment to the Receivables Purchase Agreement amends the Receivables Purchase Agreement dated as of March 5, 2012, as amended. 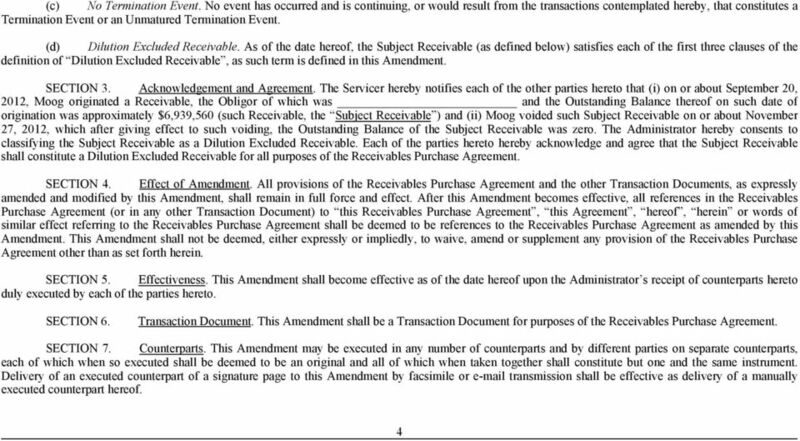 Among other matters this amendment extends the maturity of the facility to March 3, The above description does not purport to be complete and is qualified in its entirety by reference to the Form of Second Amendment to the Receivables Purchase Agreement, which is filed as Exhibit 10.1 to this Current Report on Form 8-K and incorporated by reference herein. Item 2.03 Creation of a Direct Financial Obligation or an Obligation under an Off-Balance Sheet Arrangement of a Registrant. 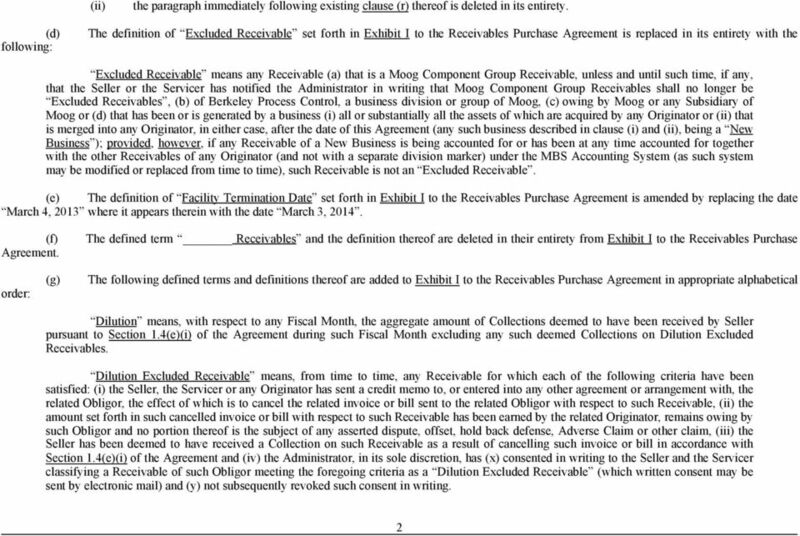 The disclosure set forth in Item 1.01 is incorporated in this Item 2.03 by reference. Item 9.01 Financial Statements and Exhibits. 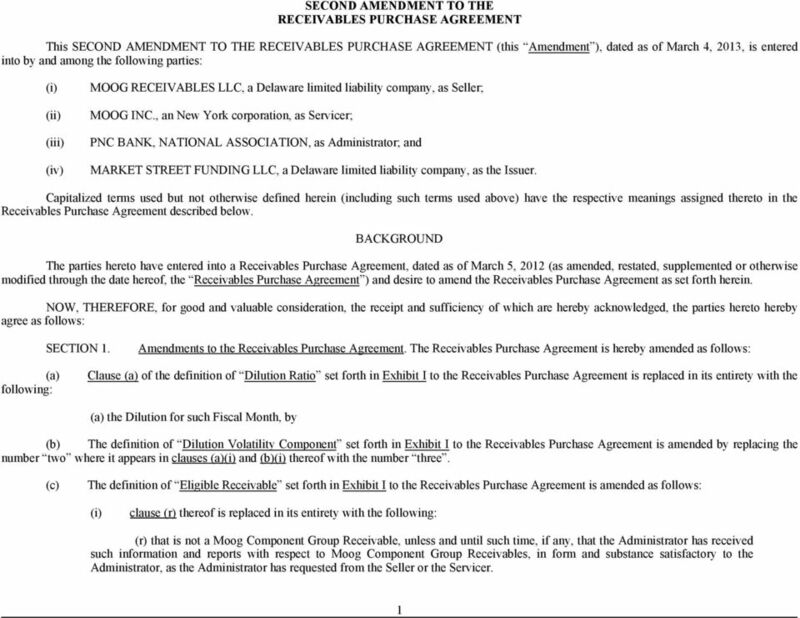 (d) Exhibits Form of Second Amendment to the Receivables Purchase Agreement, by and among Moog Receivables LLC, as Seller, Moog Inc., as Servicer, Market Street Funding LLC, as Issuer, and PNC Bank, National Association, as Administrator. 5 EXHIBIT INDEX Exhibit Description 10.1 Form of Second Amendment to the Receivables Purchase Agreement, by and among Moog Receivables LLC, as Seller, Moog Inc., as Servicer, Market Street Funding LLC, as Issuer, and PNC Bank, National Association, as Administrator.